My NFLX saga ends today…with a bottle of champagne after the close. After the last earnings report when NFLX soared, I got the “great” idea to buy 100 shares at $358 and sell DITM calls for a guaranteed win. Within days there was a massive crash. I took inspiration from seeing @fuzzballl accomplish significant cost basis reduction with patience and perseverance. I vowed I would stick with this until it was profitable. Every single week I sold calls, and bought put butterflies (BWB debit flies). Most of the time they brought in nice credits, there were a few weeks that were debit rolls (debit rolls would step back cost basis those weeks), but I steadily took Cost Basis from $358 to $272. Today I was able to close out the full position for a net $1547 gain. 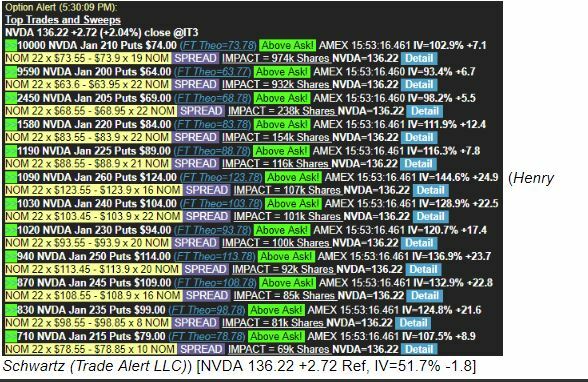 Market Color NVDA – Interesting 12-leg Nvidia put spread minutes before the close totals nearly quarter-billion dollars premium. Over 31K deep puts traded in NVDA at 3:53PM ET today in an odd spread that involved 12 deep-in-the-money puts expiring Jan 18th. Stock was $136.22 at the time, and the package consisted of offer-side blocks in the 200 to 260 strike puts, priced from $64 to $124. Weirdly, size of each block is very near the open-interest of each contract and the price on each block was a whole dollar figure, 22c over parity, with total premium just under $244M. If the package was a buyer of all legs, the delta is nearly 2.4M shares, or 9% the adv of the stock. With negative AAPL headlines out after the close, NVDA shares are down nearly $4 to $132 which could be a gain near $9M if the spread was a dodeka-stupid. 2. Scott used to be at Random Walk and the Random Walk website has some of Scott’s classes…some are even FREE…so I recommend going to www.randomwalktrading.com before doing anything at Stratagem. The “Layered Spreads” class at RW for $95 (on sale right now) is a must investment I think. Very very good, and taught by Scott. You get a very detailed pdf book with the course. If you buy the course, you get access to many videos immediately, but the PDF takes a couple days to receive while they do the ID encoding. All the doc downloads at RW are encrypted with your personal ID…so you can get in trouble if caught sharing them. Ed T. at Random Walk has the “OIA” subscription for $50/ mo….excellent value for what you’ll learn and his professional delivery. 3. Aeromir www.aeromir.com (Aeromir took over the defunct “Capital Discussions” group) has a free membership that gets you two week access to tons of videos (rolling two weeks)…definitely do the RTT 1 month trial for $25.00. You’ll learn a ton of good stuff. After the first month it’s $155. I think you can learn enough in the first month to go it alone. The trial will inundate you with info though….tons of email updates, risk graph images, texts on every update, videos to watch. They’ve recently launched two new services based on RTT, that give you “light” versions of info for a cheaper monthly expense. Just do the full trial and you’ll be on your way. RTT’s have struggled a bit with us in backwardation right now, so they have needed a lot of management…which is actually good to see the approaches they take for defense (Risk Reversals, Rolling Thunder hedges, Reverse Harveys). Aeromir does a lot of roundtables bringing in various trade experts to talk about their designs. If you search on YouTube for “Aeromir Scott Ruble Roundtable” he recently did a really good session on Rolling Thunder. I’d classify Aeromir as kind of a “bulletin board” type core, surrounded with different trade services. Low tech website, but they do bring in some good roundtable speakers, and “Trading Group 1” in the videos are usually worth listening to. I think that’s about it, I’ll add more if I think of it. 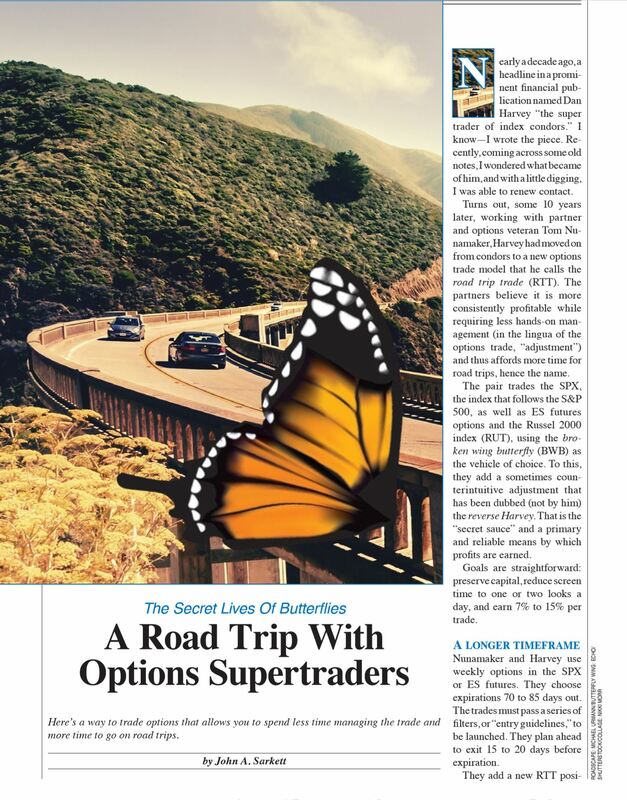 Below is a snap of an article in Stocks and Commodities magazine about the RTT. I have the pdf if anyone wants it, drop me a line. smasterson@yahoo.com Or you might be able to google it. Hi Everyone! I just couldn’t find a new bread-and-butter trade this year that justified reporting, so I lost track of a lot going on here. I did find some good new approaches though. I found Scott Ruble (Stratagem) to be an excellent teacher on structured courses, but a terrible terrible subscription provider. @kathycon and I have used several of his approaches in the last few months to make money…#AdvancedRiskReversals, #SpikedCollars, #LayeredSpreads, and #RollingThunder. Scott was with Random Walk for awhile before having a falling out. Ed has taken Scott’s place at Random Walk and has a $50/mo subscription service that I quite like. Very reasonable for what you get. Ed’s approach is #PregnantButterflies which layer in spreads in a way to provide wide profit ranges, often risk free. The #RTT (Road Trip Trade) trades at Aeromir are good (BWB), and they manage them very dynamically using a lot of Scott’s teachings. The one month trial of RTT is very worth it. Option Pit is still great….but VERY deep and takes a ton of cerebral work….especially if you think you know it all already (like I did). The only update I’ll give is on NFLX. I made a solemn vow in @fuzzballl ‘s name that I would stick with this until I was even. I started at $358 a share and am now down to $272….that’s a ton of cost basis reduction! I’m accomplishing this two ways…. 1. using weekly debit wide broken wing put flies (Ed calls them “Venus Flies” for the downside collar, and. 2. using weekly covered calls to finance the flies. As you can see I’m still off the mark on break even….but I’m being mechanical with the income collection and tracking every cent against the cost basis. I’ve only got 100 shares of NFLX so the ride down has been manageable. Hope we all get what we want from the market next year! This last year is one of those that seriously refines you as a trader. Survive….and you come out a much better trader. I caught a rare Liz & Jny this morning “Calling All Millionaires” and caught their #Zebra trade (Zero Extrinsic Back Ratio). This is a little similar to the #Cobras I was doing a little while back (Covered Back Ratio). It looks like a good way to keep some short delta in the portfolio. My trade today: BTO SPX Sep 26 2940 put (30DTE, 70 Delta) @51.70 x2, STO Aug 29 2900 put @ 6.80 x1. These get rolled every two days (keep track of accrued credits against the longs). BE $33.30, profit levels: step 1 $304, Step 2 $504, Step 3 $704. 50% of step is my target.